I managed to find a deseamed shell and documents which i am starting to build up. I have an SPI mini 1992 with 22k on it, that i have very little money in, so i am planning on using the complete rear subframe assembly (heritage previous owner fitted pretty much brand new) fueling, and the complete engine unit. Before i start getting the car in paint is there anything that i am going to have to weld etc to get the engine and ancillaries in? As you may understand, if i were to build from scratch it would cost alot of money to get it up and running. - There is a remote shift cut out, i assume i will have to weld this hole up and take a template from the spi shell for a cut out, for the new shifter. - I am not going to be able to use the Spi electric fan, would it overheat without it if i used something like evans coolant, or could i retrofit an electric fan? - I am going to have to drill and bolt the ecu bracket onto the inner wing. - I have a good twin bolt front subframe, will the engine mounts bolt straight onto that? - I will be using a centre binnacle, so i will just have to get the wiring conversion from minispares. - The relays and wiring on the bulkhead can just be riveted onto the mk1 bulkhead. - Maybe decat the exhaust and fun better manifold and rc40? Can anyone think of any other major changes i will have to make, i know i will run into a few problems along the way. Edited by fiestaharry, 31 January 2019 - 06:24 PM. dont bother with the SPi set up convert it to carb much more in look to the original. yep just about the only thing you will need to do is mod the hole for the linkage. note there are no mounts for rear seatbelts and most of the glass will not fit. I think i will stick with the spi and then go to carb if/when i get issues, seat belts shouldnt be an issue as i dont think i will have a rear seat due to the alley cage. I have a stock of mk1 glass so that isnt an issue. Will the curved centre tunnel be a problem where the later cars are squared off? Carb convert the SPI as you won't need the extra relays etc on the bulkhead. The SPI engine will fit the car but your throttle body will catch the bulkhead as the SPI engines were 1/2 inch further forward in the frame. Carb fuel lines too, just easier in general, and you wont have to deal with the stupid rover mems system. I have a new SPi engine and am converting to carbs, need to change the dizzy. Although if you do convert you will need to change the tank I believe? You will also need to drill extra holes in the boot for fuel lines etc. Looks a good project. You need to buy this kit in link below or make a similar adaptor bracket. This way you do not have to alter the early floor tunnel or cut-out and preserve the value and originality of your early bodyshell. 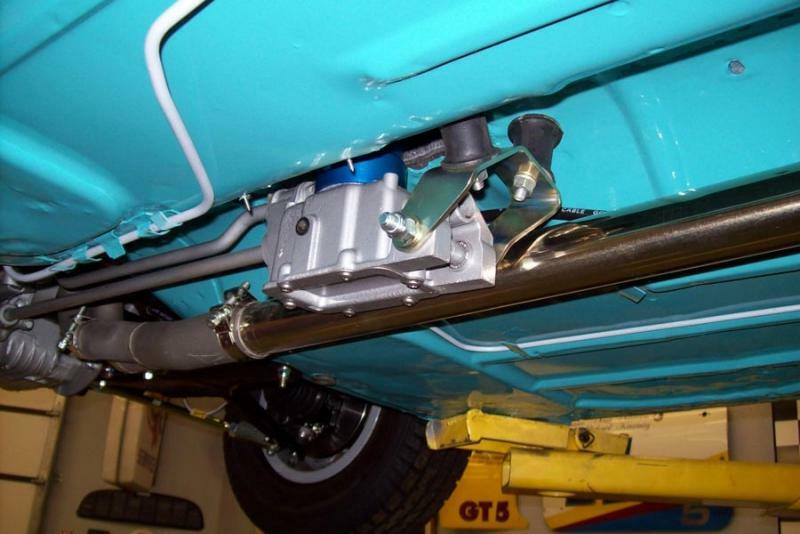 "Rod Change Installation Kit If you are among the very many of us that are finally updating our vintage Minis to the more modern Rod Change shift linkage, Mini Mania can now make it a lot easier. Any Mini body not originally equipped with a rod change has a difference in the floor tunnel where the end of the shift extension is mounted. On the later cars it is squared off and on the early cars it is rounded. The stock rod change mount is flat! Mini Mania has now designed an easy to install kit that allows a direct bolt-in of a rod-change shifter into an early car. This kit includes rubber mounts, bracketry and drilling alignment guides." Minispares also sell this bracket but currently out of stock. Nice to see an early deseamed 'period modified' Mini as so few have survived or were done well. 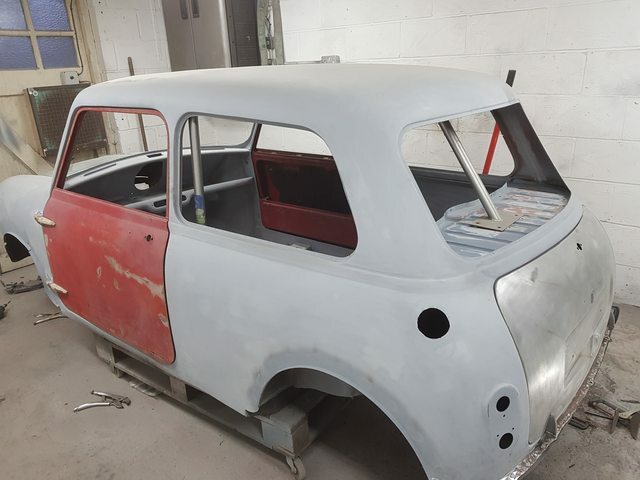 It will make a great project and will stand out from all the factory standard restored Minis that are seen at shows today. SPi electric fan is an easy fit to inner wing under the wheel arch, I just used some spacers to stand the fan off the early vertical vent cutouts, no need to cut a large hole like the later shells and again retaining an early feature. Later engine mounts are same and fit earlier subframes but as stated SPi engine was half inch further forward, you can elongate the holes in subframe to later spec if you wish. Brian Gunn charts the process of fitting an MPi engine to his 1983 Mini. Edited by mab01uk, 01 April 2019 - 10:26 AM. I'm taking my SPI engine out this weekend for a carb 1310, i have constant issues with the stepper motor causing the revs to fluctuate from 500rpm to 3500rpm idle.. had enough of it so going carb. I built an engine for an SPI and we put twin HS4's on with a 266 can and a better head. The distributor was an Aldon 'Yellow', it had a lighter flywheel, 10:1 CR and it went very well. With regards to the rod change i am assuming i have to weld the hole up for the remote change and then cut a new hole in the tunnel for the rod change? And the 1/2" forwards change in the engine mounting, is that an exact science, can i just measure and drill the subframe, would rather not put any slots in it. "If you are converting from a “Remote-shift” transmission, you may use the existing hole in the tunnel (for the rod shift)."